At Medina Family Dentistry, we’re dedicated to helping patients of all ages achieve all of their oral healthcare goals, so they always have a healthy smile they’re proud to share. 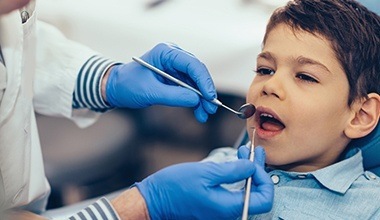 When it comes to providing dentistry services for kids, your dedicated family dentist in Medina, Allan J. Milewski, DDS, is especially conscientious of the necessity to provide gentle, friendly care. We want kids to grow up enjoying their dental office appointments, so they don’t dread coming to see the dentist. Instead, we take the time to offer fun and affective dentistry services that teach kids how to care for their teeth and keep young patients smiling for a lifetime. If it’s time for your little ones to come in to see us for their first appointments, give our dental office in Medina a call today. We look forward to helping your little ones with all of their oral healthcare needs. Convenience – you can bring everyone to see us on the same day instead of making multiple trips to more than one office. Consistency – when kids visit the same dentist throughout their dental development, they receive consistent care from a dentist who is familiar with their oral health care needs. 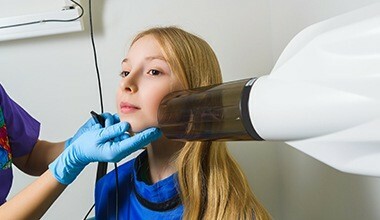 This ensures young patients receive consistent treatment at every stage of dental development. Comfort – your child will see you visiting our team and they’ll grow up coming here too. That means visiting the dentist never has to be a stressful or scary experience. 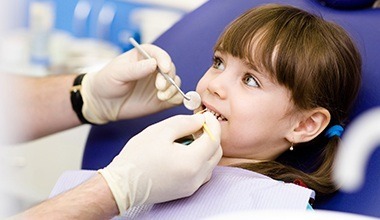 Instead, your child can experience complete comfort when visiting their trusted family dentist year after year. The backbone of every dental care plan for both kids and adults is visiting the dentist twice a year for dental checkups and teeth cleanings. These biannual exams ensure any oral health concerns are diagnosed in the earliest, most treatable stages. This makes it possible for us to preserve healthy tooth structures and limit your child’s risk for more serious oral health concerns that mean more invasive, less comfortable treatments. Dental Sealants – these simple to apply protective coatings create a barrier between tooth enamel and decay-causing bacteria and plaque. Fluoride treatments – to improve the strength and density of tooth enamel, professional fluoride treatments may reduce your risk for tooth decay, excessive enamel wear, dental sensitivity, and other oral health concerns. 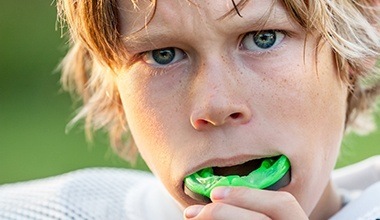 Sportsguards – for young athletes, athletic mouthguards are essential to protect smiles from damage caused by impact with other players, hard surfaces, or sports equipment. Emergency dentistry – when young patients are experiencing oral health issues, our team is here to help providing same day emergency dentistry services to relieve pain and restore smiles as quickly as possible. During your child’s dental exam, we’ll be happy to review at-home oral hygiene routines to ensure kids are brushing and flossing correctly, using the right products, and most importantly, helping kids enjoy keeping their smiles healthy. No matter how many times we need to demonstrate proper at-home hygiene or answer your child’s questions, we’re here to help.